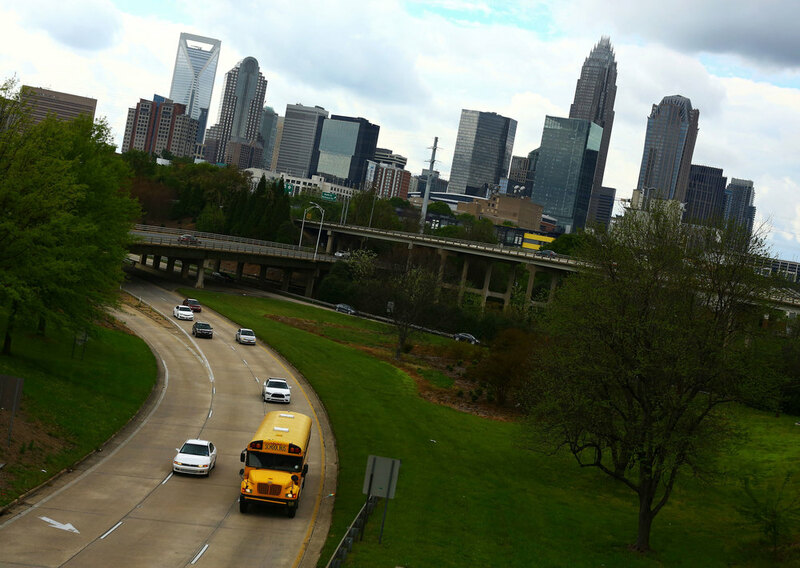 A yellow school bus passes through Charlotte during the afternoon commute. Photos by Travis Dove. This article is reported, edited, and published in partnership with EdNC, an online-only nonprofit covering education policy and politics in the Tar Heel state. The night after the Carolina Panthers lost Super Bowl 50, more than a thousand fans packed onto the sidewalks around Bank of America Stadium in Uptown Charlotte to welcome the team home. They were Black and White, poor and wealthy, successful and struggling. They stood side by side, whooping and cheering. But at a time when Charlotte has never felt more united, the discussion in a Methodist Church some 20 miles to the South laid plain the deep divisions on race, economic opportunity, and education in a city that for decades viewed itself as a national model for successful public school integration. The green folding chairs lined up in rows were filled, mostly, with white parents of Charlotte-Mecklenburg Schools students. CMS, as the district is called, serves roughly 145,000 students, is the second largest school system in North Carolina and is the 17th largest district in the nation. This meeting was in Pineville, a predominantly White small town in southern Mecklenburg County—essentially an extension of the Charlotte suburbs—that’s home to conservative politics and high-performing public schools. The audience had gathered for a community forum about the upcoming CMS student assignment review, a process the district launches every six years or so to re-draw the boundaries that determine where kids go to school. It has almost always been acrimonious, but especially so this year. Public school campuses have resegregated by race and by income since the end of court support for the plans that integrated the districts schools. Without a judge telling CMS that the district must use student assignment to balance racial or other demographics, the school board has broad authority to draw the boundaries it sees fit. The Charlotte-Mecklenburg Board of Education and groups like the one that hosted this meeting have suggested using student assignment as a tool to address economic isolation in the county’s schools. A vocal and politically influential group of parents from the suburbs disagrees, viewing the suggestion as a call to return to the court-ordered busing plan that sent children miles away from home to integrate classrooms in other parts of Charlotte. And so—four and a half decades after the landmark Supreme Court ruling that established busing programs here and in hundreds of other school districts in the segregated South—North Carolina is once again home to a robust debate about race, poverty, and the quality of public education its students receive. It’s a discussion that’s happening elsewhere as America’s schools become increasingly segregated, but no other city has had Charlotte’s experience. Student assignment is a contentious process. It raises concerns about the disruption of carpools and family routines. It took just under 40 minutes before a parent in the church classroom used the word fear. Dorothy counts walks to her first day at Harding High school in Charlotte, North Carolina. Courtesy of the Robinson-Spangler Carolina Room – Charlotte Mecklenburg Library. Much of the nation first learned about the Charlotte-Mecklenburg School system in September 1957, when Dorothy Counts, a Black high school student, attempted to enroll at all-White Harding High. Counts, wearing a plaid dress with a ribbon down the front, was met by an angry crowd that jeered as she walked toward the school building. Charlotte Observer photographer Don Sturkey’s picture of the scene appeared in newspapers across the country. Of course, his was not the first photo of Black schoolchildren braving a mob on the way to class. Three years earlier, in 1954, a unanimous Supreme Court ruled in Brown v. Board of Education that state-sanctioned public school segregation, through so-called “separate but equal” policies established in 1896 under Plessy v. Ferguson, was unconstitutional. The Brown ruling set into motion change at public schools throughout the nation—though some districts embraced desegregation more quickly than others. The Supreme Court said “separate educational facilities are inherently unequal,” but didn’t give guidance on how communities should go about integrating their schools. In a case the next year, the justices wrote that public school desegregation should happen “with all deliberate speed,” leaving school districts and local authority’s in charge for how and when to bring Black students into White schools. Despite that order, Charlotte struggled with desegregation even after Dorothy Counts’s attempt to desegregate Harding. The city still had 88 segregated campuses by 1965. Many were situated close to one another in what were known as dual school zones that were de facto Black and White school districts throughout the city. That year, when Rev. Darius Swann and his wife Vera wanted to enroll their son, James, in an integrated school, they were told to go to an all-Black school in an adjacent neighborhood. Believing the school board’s policy to be discriminatory, they filed a lawsuit through Charlotte civil rights attorney Julius Chambers that would become Swann v. Charlotte-Mecklenburg Board of Education, the definitive court case on pupil assignment. In 1969 federal judge James McMillan ordered the Charlotte-Mecklenburg school board to come up with a plan to end segregated schools—a plan which McMillan rejected as insufficient. He appointed an expert from Rhode Island to devise a better, albeit complicated, strategy, which became known as the Finger Plan. It bused students of different races from neighborhood to neighborhood in an effort to fully integrate Charlotte’s schools. In 1971, as the Finger Plan was already beginning to take hold, a unanimous Supreme Court endorsed McMillan’s ruling that busing was an acceptable strategy to use in a student assignment plan. It’s a system that many in Charlotte believed was a success in CMS—and was a model for the nation—for nearly three decades, until the late 1990s when a suburban father sued the school district alleging his daughter was denied entrance into a CMS magnet school because she was White. The court fight, which brought long-simmering suburban opposition to busing to the surface, once again divided Mecklenburg County. In 1999, federal judge Robert Potter—who had publicly opposed desegregation as a private citizen in the 1960s and 1970s—ruled that CMS was “unitary” and could no longer use race in student assignment decisions. The district appealed, but ultimately, the Fourth Circuit Court of Appeals sided with the parents. That decision meant the school board had to adopt a new attendance boundary map—the “choice plan,” as it became known—which would move students back to the campuses closest to their homes, with options to attend magnet schools in other parts of town if parents wanted. Dorothy counts scoggins continues to advocate for integrated schools. in front of Harding High school in April 2016. The community forum in Pineville got off to a bumpy start. People were still trickling in as Amy Hawn Nelson, a UNC-Charlotte researcher who speaks frequently on the resegregation of Mecklenburg schools and housing, struggled to get her slide presentation to appear on a projector screen. The crowd quickly filled the room; organizers brought in extra chairs from down the hall. Some of the parents in the audience shifted in their seats. The vinyl squeaked under their blue jeans. Finally, with the slideshow working, Hawn Nelson launched into her presentation, a variation of one she’s given dozens of times at community forums across Mecklenburg County since the school board first broached the idea of a significant student assignment review a year ago. She called integration in Charlotte-Mecklenburg Schools “a rejected success.” Today, a third of the district’s 168 campuses are segregated by poverty. Half are segregated by race, and a fifth are hyper-segregated by race, which Hawn Nelson defines as a student body of at least 90 percent from a particular race. “We have totally re-segregated our schools,” she said. The situation is exacerbated by Mecklenburg County’s housing patterns, which create a wedge of primarily White, affluent families in the southern part of the county and a crescent of diverse, less affluent families who wrap the urban core. “School policy is housing policy in our community and housing policy is school policy,” Hawn Nelson said. That isolation creates profound impacts on students in CMS classrooms. Using data from the North Carolina Department of Public Instruction, Hawn Nelson selected 30 elementary schools—the 10 with the highest concentration of White students, the 10 most racially balanced and the 10 with the highest concentration of Black students—and compared third grade reading proficiency scores. In the schools with the greatest percentage of White students, 82 percent of third graders read at or above grade level. Proficiency drops to 59 percent at the balanced campuses, and to just under 29 percent at the ones with the highest concentration of Black students. The data, Hawn Nelson said, speaks for itself. “Segregation results in concentrated educational disadvantages,” she said. Diverse schools, however, yield tremendous benefits, both educational and non-academic, to children—especially to children of color and those living in poverty. She cited roughly two-dozen studies that point to improved educational outcomes such as better test scores, higher graduation rates, and lower dropout rates for minority and poor students who attend integrated campuses. Middle-class students, she says, don’t experience academic harm by attending integrated schools, contrary to what some parents might think. But the notion troubles suburban parents, including several at the forum, who believe their schools are succeeding, are plenty diverse just as they are, and would be disrupted by efforts to break up clusters of poverty elsewhere in the school district. They asked pointed questions and criticized OneMECK’s approach. “Our main concern here is our children will be targeted to help other schools,” a mom said from the middle of the room. “Can we just say, ‘Leave us out of it?’” another asked. Using the word experiment to describe busing is a reflection of the historical context to student assignment in Charlotte—something recent transplants to this city don’t always understand. For the better part of three decades, Charlotte-Mecklenburg was a pioneer in school integration, a place that used busing to create a diverse school system, something that, over time, felt less like a gamble and more like a bedrock community principle. But by the time CMS went back to court in the 1990s, many school districts across the South were moving away from busing as a tool to integrate their classrooms, viewing busing, as President Reagan did, as something to be shunned rather than embraced. Some believed they were unitary, that they had eliminated the dual system of Black and White schools created during the height of segregation. The signs did much of the talking, at least at first. White poster board. Block letters written in black permanent marker. KEEP NEIGHBORHOOD SCHOOLS. EDUCATION NOT TRANSPORTATION. NO FORCED BUSING. There were dozens of them, held by parents crammed into the beige meeting chamber at the Charlotte-Mecklenburg Government Center, filling all of the red seats in the auditorium that looks down on the school board dais below. The board was holding a public hearing—just one night after the forum in Pineville—about the proposed goals for the student assignment review. One speaker threatened to pull her kids out of CMS and enroll them in a charter school or move to an adjacent county if they are assigned to a different school. Many of the audience members at a school board meeting on April 12 show their allegiances through their shirts. Those in green want to keep their neighborhood schools, while the orange shirts support changes to the student assignment policies. Snyder, the father from the night before, the one who called student assignment an experiment, raised a familiar argument: Increased parental involvement makes some schools stronger than others. His children attend Ballantyne Elementary and Community House Middle—two South Charlotte schools where parents routinely volunteer on campus and show up to eat lunch with their kids. “Through our efforts,” he told the school board, “we have earned the right to continue to send our children there. There were loud groans and boos from OneMECK supporters and others who support the assignment goals. Later, Kayla Romero, a 20-something Latina woman who works with CMS students as North Carolina Program Coordinator for Students for Education Reform, a national advocacy organization that favors integrated schools, admonished affluent parents. “Consider the privilege and advantage it takes to choose your neighborhood,” she said, drawing cheers from her supporters. One woman, a White suburban mother, came to the podium and began to recount the experience she had as a CMS student who was bused in the late 1980s. “It was deemed a complete economic and social failure,” she said, describing how she felt bullied and isolated by attending a majority-Black school. This went on, the ping-ponging between neighborhood school advocates and supporters of the board’s assignment goals, for more than 90 minutes, as a split audience reacted to each speaker. Along the way, in an effort to move through the agenda faster, school board chair Mary McCray told the crowd to use “jazz hands” to show their support for a person’s comments. The cheers and jeers continued. Stephenson, who is White, works as an employment attorney and competes in triathlons for fun. Affable and opinionated, he has emerged as a leading spokesman for the neighborhood schools advocates. He dismissed Hawn Nelson’s research as “a selective blend of national studies and very small local studies,” and believes groups like OneMECK have yet to truly define what, specifically, they propose. Nonetheless, he said there is real concern among suburban parents who worry that their successful schools will be negatively affected by massive student assignment changes—or that their children will be bused to under-performing schools in the urban core. “We can’t make public policy on a This American Life episode,” Stephenson said. He added that the difference between his camp and those who support breaking up concentrations of poverty, “is I’m talking about what’s best for my child here, and they’re talking about what’s best for those parents over there. OneMECK supporters see it differently. They believe it is essential to represent parents who may not be able to do so themselves. “When I speak as a parent, I speak not just for my child, but all children who would be harmed by isolation,” said Justin Perry, a native Charlottean and licensed therapist who co-chairs the community group. Perry, who is Black, grew up attending integrated schools in Charlotte. In the late 1990s, when the courts were deciding whether to release CMS from its desegregation order, Perry and his friends from West Charlotte High held signs outside the courthouse. “We had a good feeling that it would potentially lead to the type of segregation that we’ve fallen into,” he said. When Perry, whose children will eventually attend Walter G. Byers School—one of Charlotte’s most isolated by race and family income—heard about the poor conditions a social worker saw at a poorly-funded local elementary school, he felt called to be part of the conversation. What both sides seem to agree on is the need for more community engagement. Stephenson said comments from people whose children attend high poverty schools—not from proxies but from those parents themselves—have been largely missing from the debate. Other school systems across North Carolina and the nation have seen a similar trend, though it is magnified in large, urban districts with smaller White populations and greater disparities in family income. Asheville, Durham, Greensboro and Wilmington—some of the state’s largest cities—have seen a trend toward resegregation, but not to the scale that Charlotte-Mecklenburg has. Across the state, Ladd’s research showed racial segregation in public schools leveled off by about 2008, while socioeconomic imbalances continue to increase. But Charlotte-Mecklenburg bucked the statewide trend, as the isolation of White and Black students—as well as rich and poor ones—surged. Academics tend to draw comparisons between CMS and the Wake County Public School System, the state’s largest district that serves the capital city of Raleigh. WCPSS is larger—in terms of number of students and how many ride school buses every day, as well as sheer geographic footprint—than CMS, but Raleigh buses its students fewer miles on average than Charlotte. This is because some children in CMS travel a very far and some a very short distance. “Wake’s traditional public schools are still much more racially balanced than the traditional public schools in Mecklenburg County,” Ladd says. From 2000 to 2010, Wake County’s school board factored income level into that district’s student assignment plan. No school could have more than 40 percent of its students receiving free- or reduced-price meals. But the plan led to mixed academic results, a bitter court fight, and a new school board that promised to return to neighborhood schools. The surge in charter schools in North Carolina, spurred by the Republican-led legislature’s removal of a 100-school cap in 2011, has given parents more options, but many options are also isolated by race and income. A report to the State Board of Education this year showed 57 percent of North Carolina charter school students are White, compared to just under 50 percent of traditional public school students. Des'rae Mitchell, boards her bus at a shuttle stop outside of Vance High School to another school in southwest Charlotte. Folks here have looked to other states, too, for a clue about ways to make integrated schools work without significant disruption. Louisville, Kentucky, is often cited as an example because of its popular student assignment plan that blends school choice with factors such as family income, educational attainment, and more. CMS staffers say, from a practical standpoint, the Louisville model may be the closest thing to an analogue they will be able to find. But Charlotte’s history as a leader in the busing movement, coupled with its dramatic shift to resegregated neighborhood schools make it unique and a popular subject for journalists, policymakers, and researchers. “The Charlotte-Mecklenburg district has become a cautionary tale about the consequences when a community allows its school system to separate white from black, affluent from poor,” The Washington Post wrote this winter. A 2014 study published in the Quarterly Journal of Economics said “the resegregation of CMS schools widened inequality of outcomes between whites and minorities.” That report found students who attended CMS schools that were isolated by race had lower academic achievement and were more likely to be arrested than peers who attended more diverse schools. On a breezy, pre-spring night, a dozen high school students sat in a drab conference room inside the Charlotte-Mecklenburg Government Center, a pinkish office building home to local municipal offices. They were huddled around beige tables arranged in a U formation, discussing the topic of busing and student assignment as part of the Charlotte-Mecklenburg Youth Council, a program designed to empower young leaders who are interested in civic engagement. It was a diverse group—Black and White and Asian, suburban and urban, poor and affluent. Most of the kids had cell phones sitting on the table in front of them; some slowly spun side-to-side in rolling office chairs. I asked to sit in on their meeting, and to ask a few questions, because I was curious how they think about diversity in education, broadly, and how they see the current student assignment debate. “Parents and students have very different opinions,” said Jason Kerman, a White 11th grader at North Mecklenburg High School, where about half of the 2,000 students are Black. North Meck is sometimes viewed negatively by affluent parents in the northern suburbs, Kerman said, but he values the diversity—and wishes there was even more. A meeting of the Charlotte Youth Council. Photo by Adam Rhew. I polled the students: All but two said they attend a school where the majority of students look like or come from similar economic backgrounds as they do. The two exceptions attend specialized magnet programs for arts and engineering that aren’t close to their homes. The students said they have a more nuanced view of diversity than their parents or other adults do, which they credit to social media for expanding their world view. Black-White and rich-poor dichotomies aren’t all they consider. When they spoke about diverse schools during our conversation, the students around the table regularly mentioned sexual orientation, religion, and specific nationalities. All of the students said they would prefer to attend more diverse schools, but like the adult policymakers, they struggled to say how they would achieve that balance. “It turns into politics,” said Morgan Harron, a White sophomore who attends one of the magnet schools. The school board adopted a set of guiding principles for CMS’ student assignment review in late February, after more than 90 minutes of passionate debate about the balance between neighborhood schools and diversity. The parents were back, once again holding signs about neighborhood schools, and this time wearing green t-shirts that said “Neighborhood School Guarantee” in red letters across the chest. The audience appeared less balanced than the night of the public hearing: Suburban parents were out in force. During the discussion, Tom Tate, a minister by trade and the board’s most forceful advocate for breaking up clusters of poverty, suggested that parents who have different opinions may not be in the meeting room because they didn’t have a way to get there. A couple people from the crowd booed, a break in decorum that drew shushes and glares from both sides. In the months to come, public education in Charlotte-Mecklenburg will balance the aggregate with the personal, drawing lines that affect individual households to achieve goals that reverberate throughout the nation’s 17th largest school system. All of the angst to this point has been about the abstract. These broad goals will guide the district and its consultants as they draw specific student assignment boundaries and craft an actual strategy. But no one—not even the school board, as members said that night—really knows where this process will lead. As they prepared to vote on the assignment goals, Ericka Ellis-Stewart, the board’s past chair, spoke in slow, measured phrases. “We are a community of juxtaposition, a community of dichotomy,” she said. On that fact, 45 years after Swann, this community is perfectly united.